Spray foam is the ideal material for sealing and insulating ductwork to maximize efficiency. Most homeowners are aware of the benefits of modern heating and cooling systems as well as upgraded home insulation. However, many homeowners don't realize the impact their ducts can have on their home efficiency. According to the Department of Energy, the efficiency of many heating and air conditioning systems is only 60% to 75% because of insufficient air flow through the duct system. At Dr. Energy Saver, we specialize in air flow testing and duct sealing to keep your home's HVAC system operating as efficiently as possible. When you have a properly sealed and insulated duct system, you'll notice lower energy bills and a more comfortable home environment. If you're interested in duct sealing for your home, contact us today to get started with a free estimate! If your ducts haven't been sealed, air that you've paid to heat or cool escapes before reaching your living space. 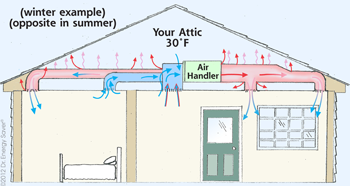 The duct system in your home distributes the air you pay to heat or cool throughout the house. When working correctly, the duct system should distribute air evenly and your home should reach the desired temperature as quickly as possible. However, if your ducts have leaks, blockage, or are too small, your furnace or air conditioning system will have to run harder to get the home to the desired temperature. Additionally, a leaky duct system can lead to some rooms being too hot in the summer and too cold in the winter. Dr. Energy Saver can run a test that determines where the duct leaks are located. We use a small fan is to pressurize your duct system and a calibrated pressure gauge is used to measure the air leakage of your ductwork. This process helps identify where you're losing air and how much you're losing. Once the problem areas in your ducts have been identified, Dr. Energy Saver can provide duct sealing. Duct mastic is a sealant designed for use on ductwork and will eliminate air leakage through gaps or seams in the duct system. Once these leaks are sealed, your system will operate much more efficiently and will do a better job keeping all the rooms in your home the same temperature. If your ducts are in the attic, crawl space, or basement, duct insulation may be recommended as well. Ducts that are in unconditioned spaces such as these will get too hot in the summer and too cold in the winter, meaning the air will have to either cool or heat the ducts before it can enter living space at the right temperature. This is extremely inefficient and will cause you to waste money and wait longer to get your home to a comfortable temperature. Ready to get started on sealing air leaks in your ducts? Dr. Energy Saver is here to provide you with the air flow testing and duct sealing services you need. Our experienced professionals will carefully evaluate your home and recommend the right solutions for your needs. Call your local dealer today to get started with a free estimate!